Katib Writers is a judiciously created, engaging, sleek and well-structured WordPress theme for writers to give them vast space to put forth their thoughts on various different topics. Apart from writers and authors, it can be used by journalists, e-magazines, online and onsite bookstores, poets, bloggers from different niches, libraries, online course providers, corporate training providers, publishers, news agencies, product advertisers, literature lovers, online music and games websites and all similar profession, businesses and websites. It is a fully responsive theme with cross-browser compatibility to entertain maximum people. Katib Writers is multilingual so you can post content in your language; supports RTL writing style and compatible with WPML plugin. 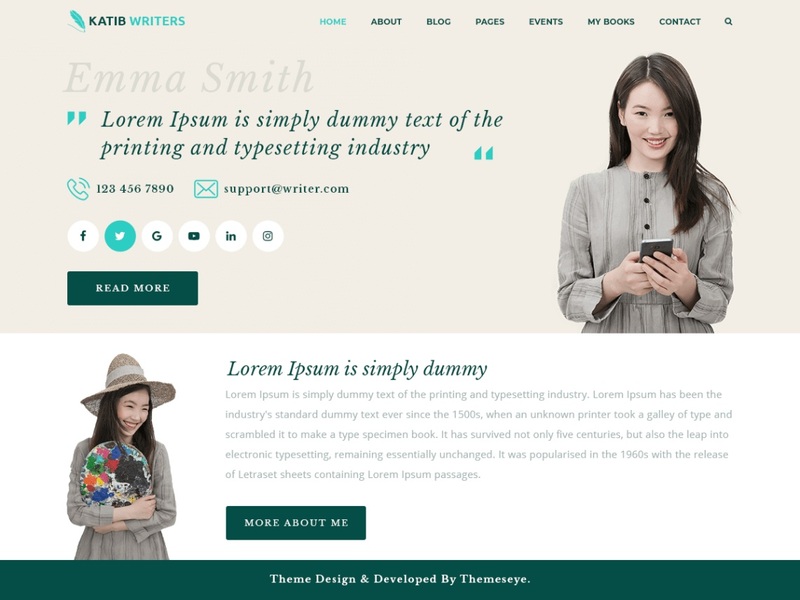 This writer WordPress theme is thoroughly customizable and fully SEO enabled. It includes various social media icons and many amazing features for a modern website. It is based on the latest WordPress version, hence bug-free and updated. It has a professional look which is complemented by its sophisticated design to hold visitors for a good amount of time.